The 2018 edition of the race will be ran over 3 stages, over 2 days. The addition of a short Time Trial will add more spice to the first road stage and offer something for individual testers, meaning the race can now boast stages for Sprinters, climbers and TT specialists. The time trial is a short affair taking place just south of race H.Q in Chew Stoke, heading directly toward the mendip hills. The road is wide and open, often into a headwind as you drop gradually down to the western edge of Chew Valley Lake. Once past the Layby next to the lake the road begins to gradually climb upwards. The climb itself is no issue at all, however the road surface will begin to sap energy as you climb up to the Blue bowl inn. The afternoon's stage will again depart from the race H.Q following the initial part of the TT route across the western side of Chew valley lake but proceed up the climb of Harptree Hill. Day 2 and the Queen stage of the race. 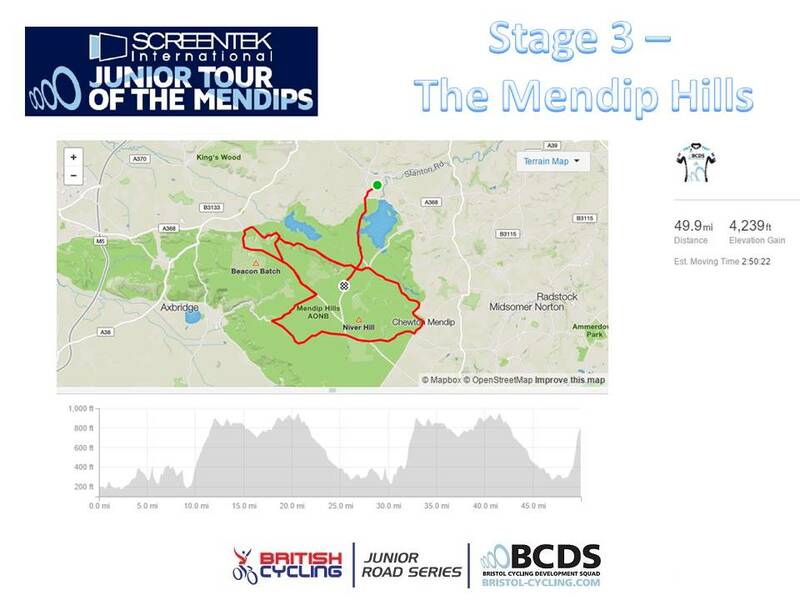 Taking in 3 differing styles but equally brutal climbs of the Mendips it's a stage for the tough riders who can climb and contribute in a group. Rolling out from H.Q the race follows the same initial 2 miles before turning right at the crossroads at Harptree Hill (which will be raced up later). The rolling road to Ubley is all big ring stuff as you climb and descend the lumpy roads through Blagdon and then taking in the 3.5 mile long climb of Burrington Combe and retracing part of yesterday's stage past the rifle range and Priddy. Riders continue to Chewton Mendip to pick up a fast but simple decent off the Mendips and into the twisty roads to West Harptree. Riders will again pass the foot of Harptree hill as if to build the tension more and retrace the route to Blagdon before tuning left on the "berg" esque style Bladon Hill. 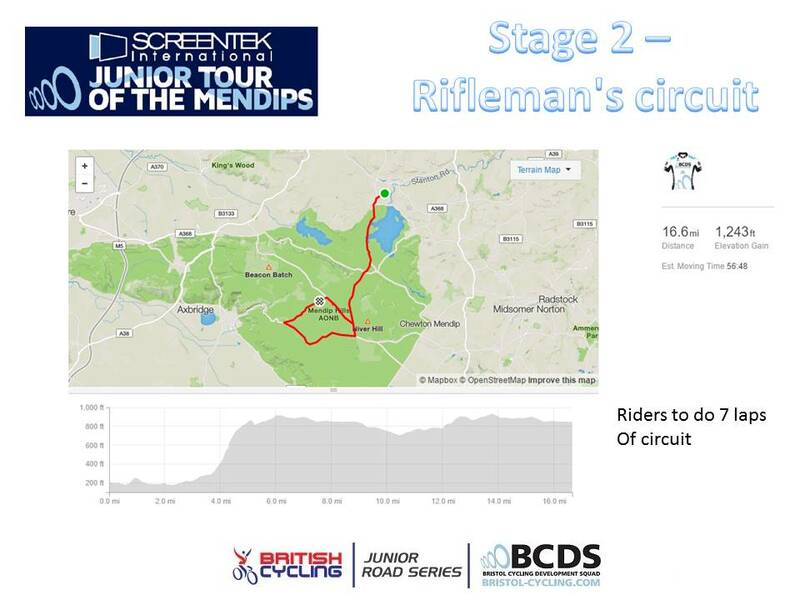 It will be a scramble down the gearing as you tackle the 20% sections if the first half of the climb before it flattens out briefly to give you chance to pass the feed station before ramping up in 2 more sections to the top and the 2nd KOM point of the day. The route then retraces the same route back to West harptree where you then turn left up Harptree hill to the finish around 200m Shorter than that of the KOM point on Stage 2. Where it will be mano to mano all the way to the line to crown the stage winner and perhaps the overall winner of the race.